Are you Jewish, Single and 50+? 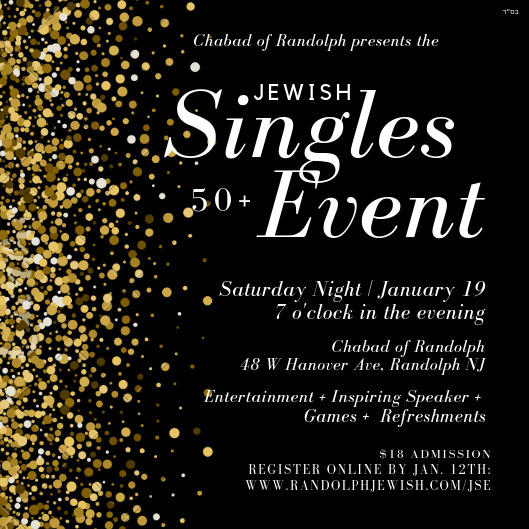 Well, there's only one place you’ll want to be this January 19th, 2019 – at the JEWISH SINGLES EVENT 50+ in Randolph NJ. The event will feature great entertainment, an inspirational speaker, activities and of course refreshments. For those looking to meet other Jewish singles from all backgrounds and affiliations, consider attending this meaningful and entertaining singles evening that will warm your heart and soul! Admission is $18 per person.